Back in the day (I'm talking late 1980s, early 1990s), these things used to be a staple wherever cheap toys could be found. Whether it was at an arcade, school fair, carnival, or grocery store vending machine, it wasn't hard to come by these little hard plastic rings shaped like monsters and other weirdo creatures. I remember getting most of mine as game prizes from a Halloween fair that was held in my elementary school's gymnasium. I have no idea how many different designs were made over the years, but there were a few different varieties. The first kind, shown in the bottom four rows of the first photo above, had at least six different sculpts: a skull, a lion/tiger-head thing, a pair of creepy hands, an owl head, a bat with a weirdo face, and a ghoul/zombie head. They came in many different colors, from dull earth tones to bright neons. Another type just had one sculpt--a wider, smoother skull face--that also came in a variety of colors (this kind is shown in the second photo). And then there were some random ones that would show up, like the snake and the very cool monster head in the top row of the first photo. I believe I got those out of a vending machine around the same time. I don't have any concrete information on when and how the sculpts of these rings originated, but I believe versions of them had been out in one form or another for at least a couple decades before I got mine. Does anyone else remember getting these anywhere, or have any information on how they were first released? I wish I knew more about these, I remember having some of these, but as a kid I kept horrible track of such things and thus they're lost. 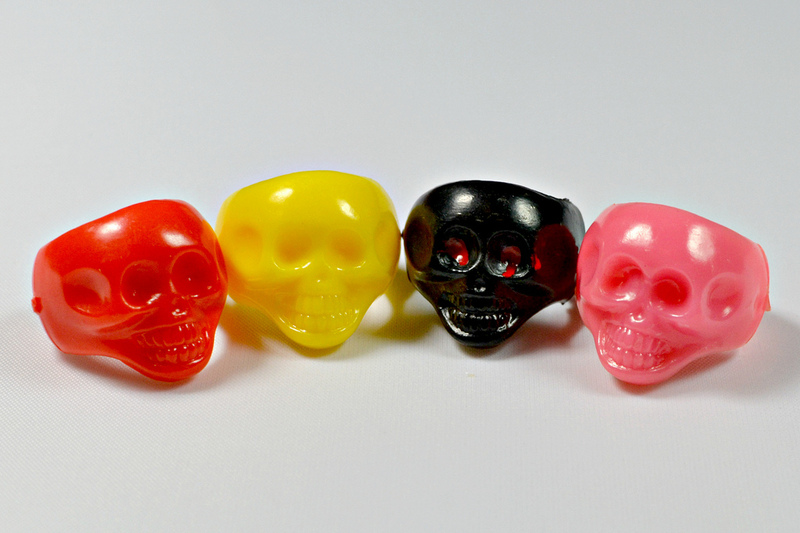 Monster rings were my favorite trinkets, right after monster finger puppets. Yeah, these rings seemed to be all over back in the day! Have a ton of the finger puppets too--maybe I'll do a post on those one of these days. Fortunately I was pretty much a toy hoarder as a kid and made it a point to keep track of all this stuff and hang onto it. That's good. Toys are pretty much the best thing to hoard away as a kid. If you don't you regret it later in life. And you definitely should do a post on the finger puppets, those things were the best!